As the last adventure island promotion from BitStarz came to an end, the casino is now opening a new player tournament called Spring Break Cancun. 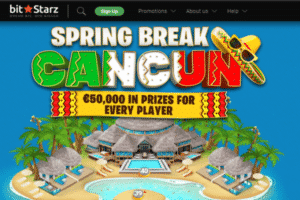 Whereas the last competition offered you a chance to win a free trip to Mexico for two, this new leg of the casino’s recurring tournament is offering you a free trip to Cancun instead. And if you ever feel the need for even more prizes, you also have an exciting new promotion at Cloudbet which will end up distributing a total of 8.2 BTC in wager-free prizes. BitStarz new player competition officially began on April Fools’ Day and it will last for over a month and a half, right until the 24th of May. To take part in the tournament, you just need to be a registered member at BitStarz Casino and play any game you want with real wagers, including both slots and table games (no minimum risk betting). As usual, each bet you place will fill up a portion of your personal progress bar and allow you to climb one level higher on the map. Like before, the new adventure island map is split into four islands and includes a total of 40 levels you will have to complete before reaching the main prize. With each new level you conquer, the casino will award you a bonus prize which may be a cash bonus, free spins, or something else. For the first 10 players who get to level 25, BitStarz will give them an exclusive hoodie with the casino’s logo while other players who reach this level will get a €50 bonus with a 1x rollover. Still, nothing compares to the main prize which is a free travel package to Cancun that includes a 6-night stay at a luxury hotel and 2 airplane tickets or a cash equivalent of the reward! If you’re in need of an exotic vacation and are free at spring time, all you have to do is to go to BitStarz and sign up! Another excellent tournament you can join in the upcoming days is the new Spring Supreme promotion at Cloudbet Casino. Launched on April 2nd, this player competition will last until next Tuesday, April 9th, but the prizes aren’t related to how much money you spend. On the contrary, in this new competition you just have to play any of the five selected slots (40 Joker Staxx, Sevens & Fruits, Burning Wins, Legend of Cleopatra, and Crystal Land) and win something. For each prize you collect while playing for real cash, the slot will give you points calculated by dividing your win against your bet and then multiplying by 10. So, if you win €30 on a €1 bet, you’ll get 300 points (30 / 1 = 30 x 10 = 300p). According to your collected points, at the end of the competition you can win any of the available cash prizes. The first three places get wager-free prizes of €5,000, €3,000, and €2,000 in BTC equivalent while the smallest prize of €10 is given to players who end up on places 251-550 on the leaderboard. To get more details about the other rewards and rules, just head down to Cloudbet Casino today.